Having a finger in every social media pie involves a certain amount of juggling: of content as well as time. Most standard networks are automatically updated via ‘publicize’ when I update the blog. Viber Public Chats being a new platform however, is not included in the ‘publicize’ list and needs to be manually updated. So I created a weekly series of travel quotes paired with my favourite images especially for VPC, that I then re-posted on Facebook, Google+ and Twitter on subsequent days. They have been received with so much appreciation that I feel it is a shame to not use the series to direct traffic back to the blog. Starting next Saturday, the quotes will appear here first. Below is the latest from the series: an inspirational quote by Maya Angelou paired with one of my favourite images from Hangzhou, China. Underscoring the universality of adolescents with mobile phones! Until next time……happy travels, no matter where life takes you. What a fabulous series of photographs and quotes. I can’t begin to say which I like best, but that opening photo and Maya Angelou quote is beautiful. As are many of the others. Don and I are busy vagabonding Turkey Egypt and Jordan – just talking about it is getting us excited. A beautiful series Madhu. Thank you. Nicely paired and inspirational–how do you do multiple social media. I’m able to handle WP, and waiver at any other commitment. Again enjoyed your combinations. I only wish that you would put the quotes under the frame of the image. That’s my preference. Thanks Sally. This series is specifically about combining images and quotes. Do you feel the typography detracts from the image? Lovely quotes and they look beautiful with the photos. Thank you very much for your visit and lovely comment Carly. What a balancing act you do with the social media, Madhu. That’s admirable. I really like your pairings of image and quote. They are all winners. Social Studies and Geography classrooms ought to be filled with these. So now, I have just added to the pressure. Marketing. What a great idea. 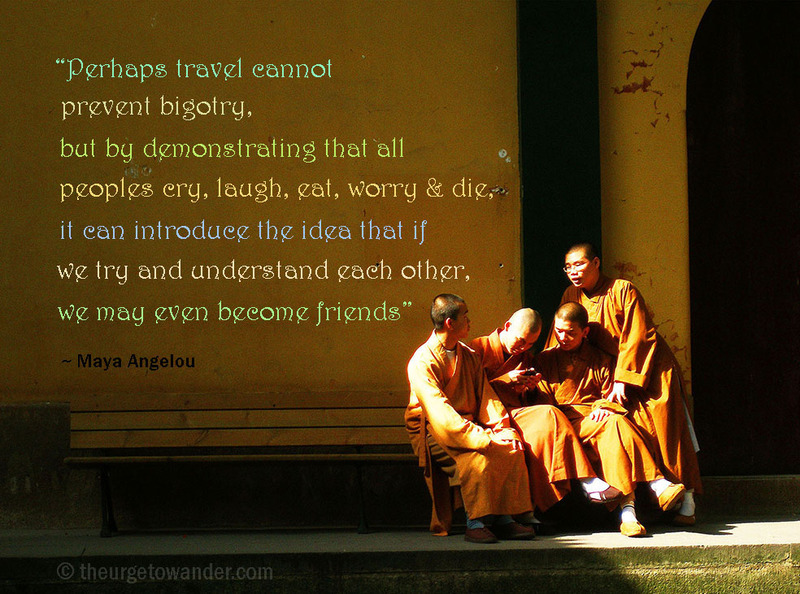 I often come across writing that speaks to me about travel, and I don’t know quite what to do with it. May I appropriate inspiration from this series of yours for my own purposes? An occasional series called something like “what writers I read say about travel”, with acknowledgement to you as my muse? I can’t seem to make the slide show work on my antiquated iPad, but next week I’ll be cohabiting again with my pc. The image and quote at the beginning are great, and I’ll definitely seek out the others. I like the overlay of text on image, and your images are always filled with you and camera skill! Meg, I am delighted you enjoyed this series. You are most welcome to use the concept in any way you please. I was inspired by images I found online myself. These are wonderful pairings, Madhu! I definitely will share periodically on Pinterest and other social media outlets! Thank you very much Kat. I love both the quotes and the photos. I wonder how you can keep up with all those forms of social media?! I find it so difficult just to keep up with my blog and its readers! I am on a number of other platforms, but I’ve always kept the blog separate – stubbornness, I suppose! Thank you. It isn’t easy. And I was stubbornly resistant too. But I have just, in the last three months, woken up to the power of social media in multiplying my reach. Glad at least you’re living the dream. I hope ‘everything’ does not include baby!!! 😀 Sid, I discovered the joy of traveling late in life. You have a lifetime ahead of you. No reason why you cannot live the dream yourself with a bit of planning. And a lot of prioritizing. Brilliant post and thoughts along with it. Thank you for sharing your great talent. Thank you for reading Cornelia. Happy Sunday! Madhu these are fab, you do everything so well! I’ve tried putting haiku onto photos a couple of times and I can never get the text as I want it – bad colour choice or size etc. i think my favourite is Ibn Battuta. PS: I love your new Gravatar image. Lovely and inspirational. The Zanzibar picture is absolutely magnificent. It’s a classic!! I can stare at that for hours in oblivion. Thank you very much LuAnn. Wonderful pairing of photographs and sayings – takes me to happy place this Sunday morning. Have a wonderful week Madhu! Happy Travelling and Happy Sharing. Glad you enjoyed this series Nihar. Have a great day! Good quotes and great pictures to matched with them! Lovely! What is vibes chats? I haven’t heard of it before. Thanks Nicole. Public Chats is a new feature by Viber. You”l be able to see the ‘Chats’ icon at the bottom of your latest version of Viber. I think it is on invitation only. Not as interactive as other platforms, which is its biggest downside for me. Fabulous collection of quotes and photos, Madhu. Looking forward to more of this series! That view from the hot air balloon in Cappadocia was breath taking!! Ha, that was more like vertigo inducing! 🙂 Thank you Kan. I fully believe in that first quote. Thanks for sharing. Thank you for reading Ian. Have a wonderful day! Thank you! I appreciate your thinking of me Kan. Let me see if I can come up with something. Would love to see what you come up with, Madhu! For me, you are one of the most inspirational travel bloggers. Have I told you that I have come back and read your post about going back to the Nilgiris, multiple times… also made A read it. It tears me up every time. Glad you do. Thank you David. Absolutely fabulous, Madhu! So many great quotes and stunning photos. It’s a great idea, Madhu! When words and images interact, magic happens. The first photograph has that magical quality, Madhu. Love the other images and quotes too. Brilliant idea. I love it! Just to clarify the quote about once a year going to some place you have never been before – does it have to be a country we have never visited before or it can be a new place in a familiar country? An inspiring set of quotes Madhu!